It was a career-night kind of night at the Palace of Auburn Hills for the second consecutive game. Perhaps feeling left out following Kentavious Caldwell-Pope‘s career-high performance against the New Orleans Pelicans, both Marcus Morris and Jon Leuer scored career-highs and the Detroit Pistons (23-27) defeated the Minnesota Timberwolves (19-31). The Pistons were full of energy early in the game and got out to an early ten point lead as a result. The Timberwolves slowly chipped away at the lead and closed to within one point by the end of the second quarter. At halftime, Morris and Leuer took over. Morris scored 21 of his career-high 36 points, while Leuer added 17 of his career-high 24 points in the second half. At the end of the day, the Pistons’ two starting forwards were just too much for the Timberwolves, who dropped their second straight game and fell further out of the Western Conference playoff race. For the Pistons, the win leaves them tied with the Charlotte Hornets for the final Eastern Conference playoff spot. And, with two straight wins, they have their eyes set on a strong finish to the season for the second consecutive year. It was another sub-par performance from Reggie Jackson, who shot just 4-for-13 from the field and failed to provide much resistance at all to dribble penetration. Jackson did add 8 assists, but his over-dribbling stalled the Pistons offense several times on a night where they otherwise moved the ball quite well. Coming off a career-high in points, Kentavious Caldwell-Pope struggled to make an impact offensively tonight. Caldwell-Pope scored only two points on 1-for-7 shooting, but did facilitate some offense with five assists. It wasn’t Caldwell-Pope’s finest night defensively – his counterpart, Zach LaVine, scored 20 points and Caldwell-Pope provided little resistance. For Marcus Morris, it was one of those nights where everything went in. 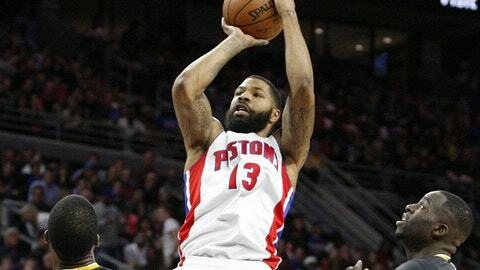 Morris scored hig career-high 36 points on 19 shots and came up big possession after possession for the Pistons. That was only half of the story for Morris, who played terrific defense on Andrew Wiggins all night long. Jon Leuer was feeling it offensively tonight, scoring his career-high 24 points on the strength of a 4-for-7 shooting night from behind the arc. Leuer’s spot up game was crucial for the Pistons’ offense, but he loses some points for getting torched by Karl-Anthony Towns a few too many times during the Timberwolves’ second quarter surge. Andre Drummond drew the easier defensive task of the Pistons’ starting big men, getting to guard Gorgui Dieng instead of Towns for most of the game. That allowed Drummond to provide great help defense throughout the game. He added 12 points and 18 rebounds, but he spent a bit too much time wasting possessions on the block offensively. Tobias Harris took a bit of a back seat tonight due to Marcus Morris’s huge night. Harris scored 14 points on 12 shots, but he never quite got into a rhythm in his 23 minutes. Stanley Johnson played good defense during his 12 minutes, a big reason for his bench-best +8 on/off rating. He struggled offensively though, and seemed to over-pass in contrast to his recent aggressive play. The defensive rotations just weren’t quite the same with Aron Baynes on the floor tonight. He was a step slow on numerous occasions, and just couldn’t provide the help defense needed against a quicker opponent. He did contribute eight points off the bench, albeit on seven shots. Ish Smith continued his recent good play, providing the Pistons a solid mid-range threat off the bench. Smith pushed the tempo appropriately and created opportunities for the Pistons bench when it was scuffling. Smith ended the game with 10 points and five assists. Stan Van Gundy had his team prepared, and it showed in a strong first quarter performance. Van Gundy’s decision to let Drummond roam a bit more defensively and provide help defense on Towns and Wiggins was a key in the Pistons’ victory tonight.